Molly Byrnes, 34, and Jesse Hofmann-Smith, 35, can’t reliably make phone calls on their cellular network from their cozy apartment on the outskirts of Taos, New Mexico, but they can host real-time webinars and build websites online for clients across the country. 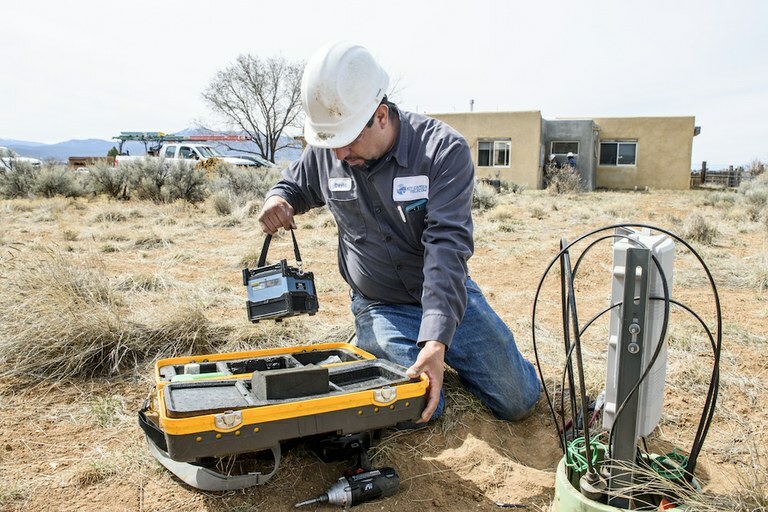 Their casita is one of about 6,300 homes and businesses in northern New Mexico connected to a high-speed fiber-optic internet network run by an unlikely source: the local electric cooperative. An increasing number of rural electric cooperatives in the U.S. are launching locally run fiber-optic internet networks, a model researchers cite as a way to bring New York City-speed internet to rural areas ignored by major telecommunications companies who can’t make enough return on investment. Of the roughly 900 electric cooperatives in the U.S., 60 offer fiber-optic internet access. That’s up from just a dozen or so a decade ago. Kit Carson Electric Cooperative in Taos, since 1944 the sole electric provider in much of northern New Mexico, was one of the first. It took 10 years and three tries at federal funding to reach where Kit Carson is today: nearly 3,000 miles of fiber-optic cables entrenched underground, strung along mountainous highways and dangling over an 800-foot-deep river gorge, reaching 6,300 customers to date with a waitlist of 12,000 more. 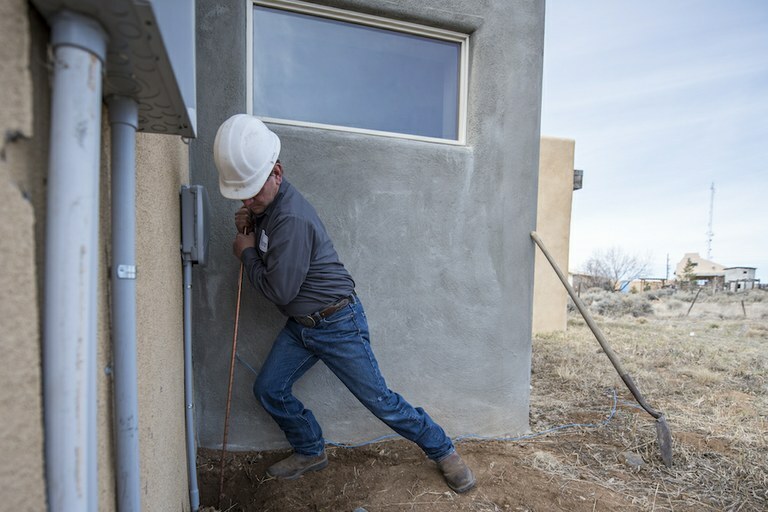 Kit Carson Telecom technician Sidney Trujillo installs a box with fiber-optic wire onto a home in Taos on March 26, 2018. 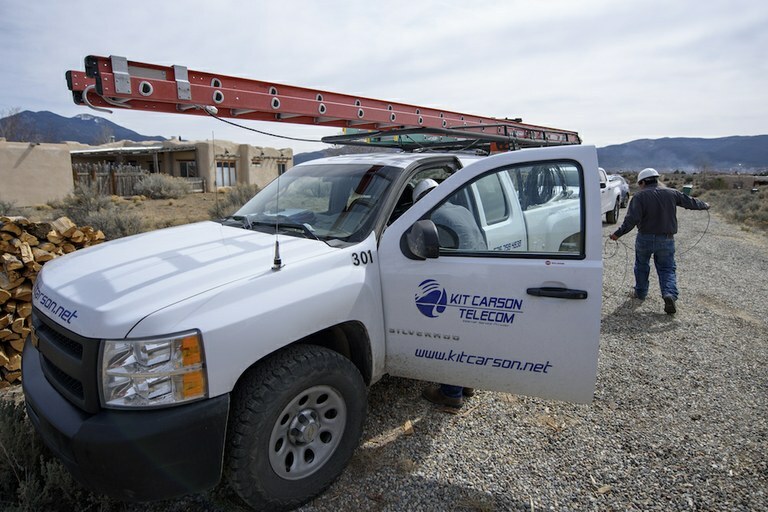 Kit Carson Electric Cooperative was one of the first electric co-ops in the U.S. to offer high-speed internet access, and now serves roughly 6,300 customers in northern New Mexico with broadband internet. It was not an easy task, and barriers persist for Kit Carson and other co-ops trying to make the switch. Kit Carson used a massive federal grant and loan to pay for its infrastructure, a route not viable for all co-ops because such federal funding is limited. Questions continue for how Kit Carson can provide back-up internet businesses need during outages. And homeowners who want a fiber-optic connection today face hefty start-up fees. But the alternative — limited to no access to high-speed internet — has implications for rural communities. One in four New Mexico businesses said they’ve missed out on business opportunities because of internet problems. As many as seven out of 10 teachers assign homework that requires an internet connection. New Mexico emergency rooms rely on a fast internet connection to transmit medical records to urban experts for consults. Kit Carson’s connection makes remote working possible for people like Byrnes and Hofmann-Smith. Luis Reyes, for 25 years the CEO of Kit Carson, now works with other co-ops that want to learn to do what he did. He sees co-ops as a natural internet provider, since their mission has always been to provide essential infrastructure to rural places. And for Reyes, a Taos native, it connects to a bigger goal. Andrew Gonzales, the telecommunications manager for Kit Carson, says cost is the biggest barrier for electric co-ops starting their own internet services. Gonzales is pictured here in Kit Carson’s server room in Taos, on March 26, 2018. By the 1930s, 90 percent of urban dwellers in the U.S. had easy access to electricity. Not so in the rural parts of the country, where only 10 percent of the population had electricity in their homes. Major electric companies said it was too hard to extend electric service to those areas; they couldn’t make enough money. The New Deal established rural electric cooperatives to do the work the big companies would not. The U.S. set out on a massive subsidy program, offering low-interest loans to rural electric co-ops. “Essentially, rural infrastructure has generally been delivered by nonprofits,” said Chris Mitchell, a researcher with the Institute for Local Self-Reliance who studies cooperatives and other community-led broadband networks. For-profit companies need to make more money than they invest. Co-ops don’t. Any extra revenue over co-ops’ costs simply goes back into the service, or to co-op members. Now, nearly 100 years since the New Deal, more than 1,000 nonprofit telephone and electric cooperatives operate in rural America. Then why is so much of rural America without high-speed internet? As many as 39 percent of rural Americans can’t access a high-speed connection, according to the Federal Communications Commission. In urban America, on the other hand, only 4 percent lack access. One argument is, simply, it takes time. It took decades for electricity to reach rural parts of the country. And, after all, not everyone agrees the internet is a public utility in the same way electricity is. Others point to the powerful telecommunications lobby, and their influence on a national discussion about whether subsidies should go toward incentivizing major telecommunications companies’ outreach to rural areas, or to locally owned initiatives. David Trujillo demonstrates how a fiber optic splicer works at a home in Taos, on March 26, 2018. An increasing number of electric co-ops, like Kit Carson, are launching internet service to their rural regions. Luis Reyes grew up in the region he now serves, first as an electrical engineer for Kit Carson for nearly a decade and now as the co-op’s CEO. In the late 1990s, Kit Carson and many cooperatives faced a crisis of declining energy demand. Reyes convened dozens of public meetings with a simple question: What other services should we provide? The answers: propane, gas stations, economic development and a service Taos residents were just starting to utilize — the internet. A year later, at an annual meeting, 1,200 co-op members voted to direct the co-op to diversify its services and look into providing internet connectivity. Kit Carson applied three times for federal assistance to build fiber-optic internet infrastructure. On the third try, Kit Carson won funds from the American Recovery and Reinvestment Act: a $44 million grant and $19 million loan to extend fiber-optic cables to electric customers throughout their three-county region. Then the real work began. Reyes hired a new staff, from installation to billing to customer service. The co-op extended a sweet deal for early adopters: For the first few years, Kit Carson would cover the cost of extending the line underground or overhead to your house. After that, that hefty cost was on the homeowner. Reyes initiated a culture change for the decades-old cooperative. A lot of co-ops are accustomed to being a monopoly, Reyes said. Not so with the internet. In Taos, CenturyLink, Xfinity and a local provider called TaosNet offer a variety of DSL, fixed wireless and cable networks. Reyes knew any dissatisfied customer could easily switch providers. Leaders like Reyes must push supervisors, build consensus with community leaders, and dedicate much of their life for several years to solving this problem, Mitchell said. It also helps to have elected officials with a long-term vision. Most local elected leaders will face reelection before benefits show themselves. Kit Carson couldn’t have done what it did so quickly without federal funding, said Mitchell, but not all co-ops have taken the same route. Continental Divide Electric Cooperative in Grants, New Mexico, for instance, is working with Reyes to design its fiber-optic internet service, which it will have to pay for on its own. The math will work in the long term, Continental CEO Robert Castillo said, suggesting that major federal grants aren’t the only way to go. Continental won’t be the first co-op to pay its way to a community-owned broadband network; for example, Co-Mo Electric Cooperative in Tipton, Missouri, went it alone and stayed solvent. “We had members coming up to us, saying, ‘When are you guys going to start providing broadband service?’” Castillo said. The local economic development director, too, told Castillo that prospective businesses’ first question was, ‘Do you have high-speed internet?’ Castillo said he’s heard major telecommunications companies say they need as much as a 38 percent return on investment. In rural Cibola County, the numbers just don’t add up. At first, the co-op board wasn’t comfortable with the idea. The group’s bylaws, after all, say they’re strictly an electric provider. But a vote to change the bylaws to start providing internet services passed by an overwhelming majority in 2016, and the board, if somewhat unwillingly, got to work. An installment crew prepares to hook up a home to fiber-optic service in Taos on March 26, 2018. Kit Carson Electric Cooperative was one of the first electric co-ops to offer high-speed internet access in the U.S., a move now billed by researchers as a plausible way to bring high-speed internet connections to a substantial number of rural areas. To be sure, there are limitations to Kit Carson’s approach, and Reyes would change a few things if he could do it again. The waitlist, for one, is long and complicated. Who has first priority? Should Kit Carson prioritize year-round residents over seasonal ones? What about the hundreds of off-grid, solar-powered homes that aren’t currently Kit Carson electric customers? Are they eligible for internet, too? In hindsight, Reyes said Kit Carson did not clearly communicate the cut-offs for financial assistance to drawing fiber-optic lines to houses and caught some customers off guard. The quick influx of customers also overwhelmed their billing system, and months into the fiber rollout, they switched to a new one. Kit Carson is still working on a set of redundant, second networks that can be a back-up for customers when the fiber network goes down. And technological problems hinder Kit Carson’s progress. Battery packs designed to power the telephone and internet in electric outages haven’t been working at the home of Kelly Motl, an accountant and Kit Carson customer who was thrilled when the co-op offered to install fiber-optic lines miles down a canyon road for her and a few neighbors in Los Pinos. Still, the connection allows her to monitor her property through a security system that live-streams video and to work from home when tax season ramps up. “It changed our lives,” Motl said. Kit Carson is a standout in more ways than just its internet service: Reyes got the co-op out of a 40-year contract that limited renewable energy in order to invest more in wind and solar, without a court case. One of his employees, troubled by the lack of young faces at local meetings, decided to convene a group of local millennials at bars around town to discuss local issues and drive more civic participation. Whether Kit Carson is an anomaly in New Mexico, or whether other co-ops can pull off what Reyes and his team have done, remains to be seen.